//When ESPN asked us to help with some awesome 16-bit styled promos, we were game. 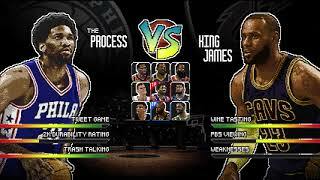 Complete with hilarious stats and nicknames, NBA on ESPN’s Basketball Battle turned out looking like an actual 90's era sports game. Our collaboration with NBA on ESPN was a slam dunk. With copy provided, it was up to our artists to create assets that seemed like they were part of an old-school basketball video game. Our artists worked in Photoshop to create digitized likenesses of famous NBA players, stats bars, and all the elements of a game’s character selection screen. After combining these assets in After Effects, NBA on ESPN Basketball Battle looked like an actual classic game we’d love to play.